There are several theories that attempt to explain why Hillary Clinton was defeated in November, and most of them are at least somewhat credible. Russian interference has been confirmed by 17 different intelligence agencies, that certainly had an effect. Former FBI Director James Comey sending his damaging letter to Congress days before the election apparently tipped the polls in Trump’s favor according to Nate Silver of 538. There are some on the left who argue that Clinton didn’t visit the Rust Belt enough, which is a fair criticism (she famously never visited Wisconsin). The new campaign tell-all book “Shattered” suggests that Clinton was a fundamentally flawed candidate with no political vision to offer to voters hungry for change; that’s harder to quantify but I don’t disagree with the thesis. All of these explanations are well and good, but they don’t explain what happened down-ballot. If it were an issue of visiting Wisconsin or being progressive, then why did Sen. Ron Johnson (WI-R) not only beat a very progressive opponent, but outperform Donald Trump by 70,000 votes? If it were an issue of being flawed or out of touch with voters looking for change, then why did incumbent Sen. Roy Blunt (MO-R) whose name is synonymous with insider politics, defeat young, popular, earnest, political outsider Jason Kander? How did Republicans end up winning the popular vote in elections for the House of Representatives by 2 million votes? In 2016 voters were capable of splitting their ballot even though the environment was hyper-partisan. Take Montana for example, where Democratic Gov. Steve Daines was re-elected while Clinton lost by 20 points or Vermont where Republican Phil Scott was elected Governor while Trump lost by 26 points. 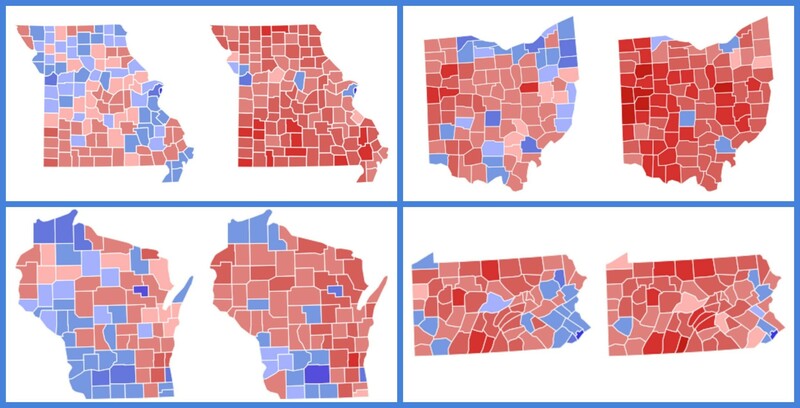 So, what happened not just in Wisconsin, Pennsylvania, Ohio, and Missouri, but across America? Broadly speaking, Democratic candidates put resources into turning out minority voters, maintaining the urban white vote, with an emphasis of reaching out to suburbanites, but in the process actively ignored rural voters. These rural voters made up 17% of the electorate in 2016. By contrast, black voters and Latino voters only comprised 12% and 11% of the electorate, respectively. It’s not that these voters are just unreachable either, as recently as 2008, 45% of Americans living in rural communities were casting ballots for Democrats. But in 2016, Hillary Clinton managed to only win 34% of these voters, and Democrats running for statewide office suffered in similar margins. These voters aren’t necessarily becoming more conservative either, Barack Obama narrowly lost Missouri by 5,000 votes and Montana by 9,000, most of the people who voted in that election also voted last November. The entire Democratic Platform in 2016 was a whopping 25,967 words, the section dedicated to rural Americans however was a mere 268 words, just a little over 1% of the platform. It wasn’t just the platform, Hillary Clinton’s website dedicated almost as many words to an anecdote about Tim Kaine going to church as they did to rural voters on her issues page. Even her very detailed fact sheet was somewhat lacking compared to the considerable effort that was put into other issues. In Hillary Clinton’s biggest moment, her convention speech, there were zero uses of the phrases “rural”, “small communities”, “farmers”, or even “agriculture”. It doesn’t make sense not to at least acknowledge these people. There was a time when the Democratic coalition depended on rural voters and they were represented at every convention and in every speech, for generations the Democratic Party was the party of the farmer. Democrats authored legislation to build infrastructure in rural communities, provide subsidies to people working in agriculture, and ran candidates who might not have been the most socially progressive people but at least believed in economic populism. Then at some point over the last 20 years, Democrats slowly pulled back, allowing a void to be created and subsequently filled by cultural resentment. Rural America has been preyed upon by Republicans. These largely white, not especially wealthy, and deeply religious areas of our country have been sold a bill of goods that if only there were fewer immigrants, that if only women had fewer rights, and if only brown people weren’t given assistance to buy food that magically things would improve. There’d be no more lead in the water, the hospitals would stop closing down, and maybe they could afford to send their children to college. Republicans have never had any intention of delivering to these voters, but as long as Democrats refuse to try for their votes, the urban-rural divide will continue to widen. The Democratic Party is a big tent party, and that means fighting for every vote. Donald Trump is a great foil right now, and presumably will be in the 2018 and 2020 elections, however the hemorrhaging of rural voters is a structural problem that could persist for decades. Frank Church in Idaho, Kathleen Sebelius in Kansas, Brad Henry in Oklahoma, Mel Carnahan in Missouri, Bob Kerrey in Nebraska and so many others weren’t elected because they ran as Republican lite. They won because they had a liberal platform that offered something to people living in rural areas, actual tangible things and not just some hokey feel good talk. Democrats can’t just wait for the demographic trends we’ve been hearing about for so long to finally win us elections. The country is in trouble now. If Democrats ever hope to win back state legislatures and be competitive not just statewide, but in the 2,600 counties that President Trump swept in 2016, then the party needs to invest in “unwinnable races” and so called “lost causes”. It’s time to forget about expanding margins in Miami-Dade and Cuyahoga, but rather, rebuilding in Salina, Kansas and Fremont, Wyoming. Democrats are the party of the people; they should act like it.